SPARROW ~ Small, cute, chubby, brown grey bird. A very common bird in human occupied habitats.They are aggressive and social. When they were at their most numerous a century ago, there were many sparrow clubs whose members competed to kill the most birds in a year. These cheeky sparrows now a days are very rare to find. Their population has been declining, as there is less food for them, because of fewer gardens and few other reasons like due to radiations, etc. I still remember during my school days as soon as I and my sisters return home from our school, along with my mom few sparrows too welcome us. I used to play with them and my mom always makes sure that bowls with grains and water is kept in balcony for them. But from few years I miss them a lot. Sparrows are useful in many ways to humans. Their lost can bring us a great loss. Hence I kindly request every one to save them. A step taken by THE HINDU in order to save our sparrows. 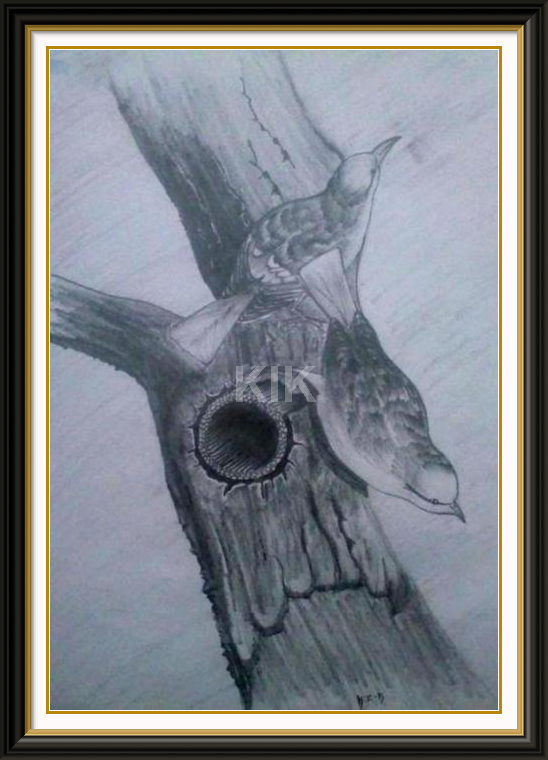 A simple pencil sketch of sparrows which I did in the year, 2009..